Texas state forests are working forests cared for using sound scientific forest management practices while protecting native plants and animals. The arboretums are places where varieties of trees are grown for research, educational, memorial and ornamental purposes. 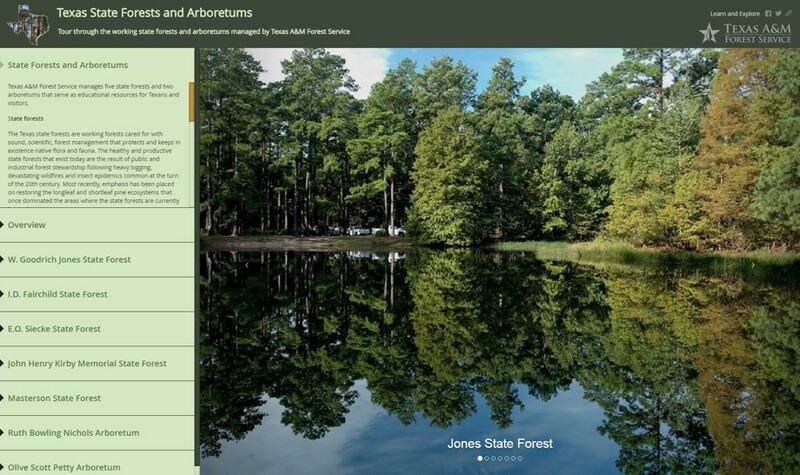 Tour through the state forests and arboretums managed by Texas A&M Forest Service that serve as educational resources for Texans and visitors. It’s been said that every tree tells a story. If Texas’ trees could speak, what stories they would tell—stories of love, honor, mystery, justice and injustice. Famous Trees of Texas, the state’s historic tree program, is an elite group of trees that have witnessed exciting events in Texas’ frontier history. 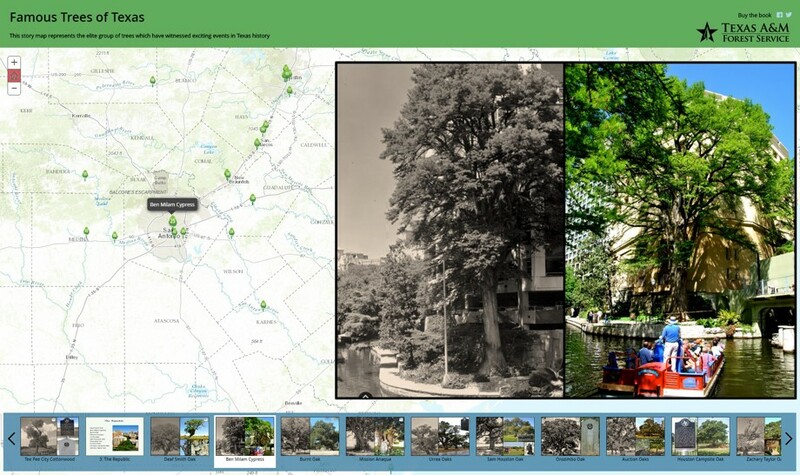 Tour the trees through our Story Map, and learn more about Texas history and the connection of people and trees through time. Texas is under threat of losing much of its working forests to non-forest uses. The State and Private Forestry branch of the USDA Forest Service administers the Forest Legacy Program (FLP) in cooperation with Texas A&M Forest Service. Tour through our Story Map, and learn more about the ecologically important forests protected by the Forest Legacy Program. Bastrop is no stranger to the devastation that wildfire can bring to a community. However, several agencies including Texas A&M Forest Service have been restoring the unique Lost Pines ecosystem. 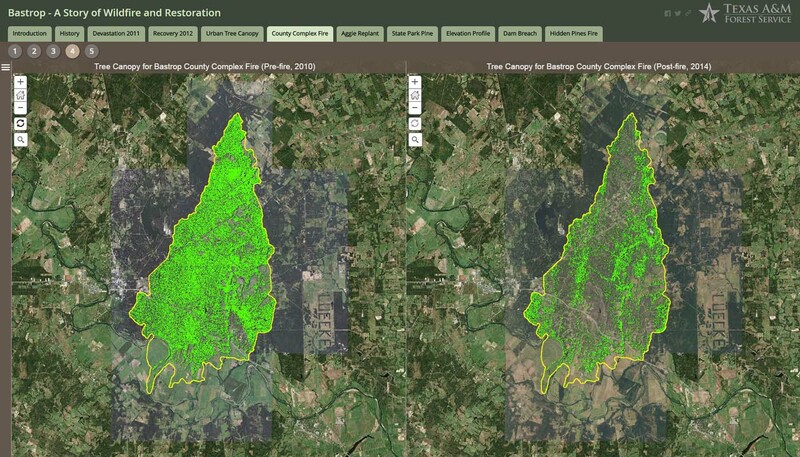 Tour through the story of Bastrop wildfire, restoration and more with interactive maps and compelling multimedia content. 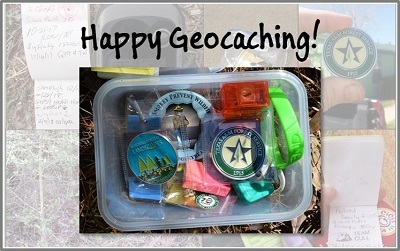 Geocaching is an outdoor treasure hunt using GPS-enabled devices. 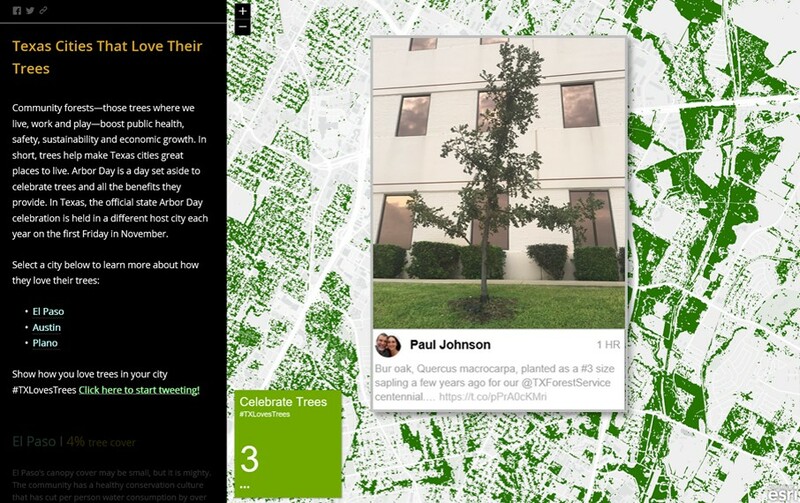 Explore the app to discover geocaches at different TFS offices throughout Texas. 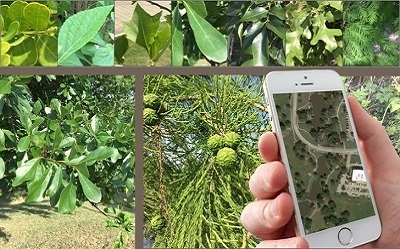 This app is a visual guide to the diverse varieties of trees and woody plants at Texas A&M University, College Station (Research Park and George Bush Library areas). Chinese tallow is a deciduous, non-native, fast growing invasive tree that is heavily concentrated in Southeast Texas. It is a very prolific seed producer, is well adapted to numerous site conditions, and has no natural enemies, enabling it to easily outcompete native vegetation and displace resident wildlife. 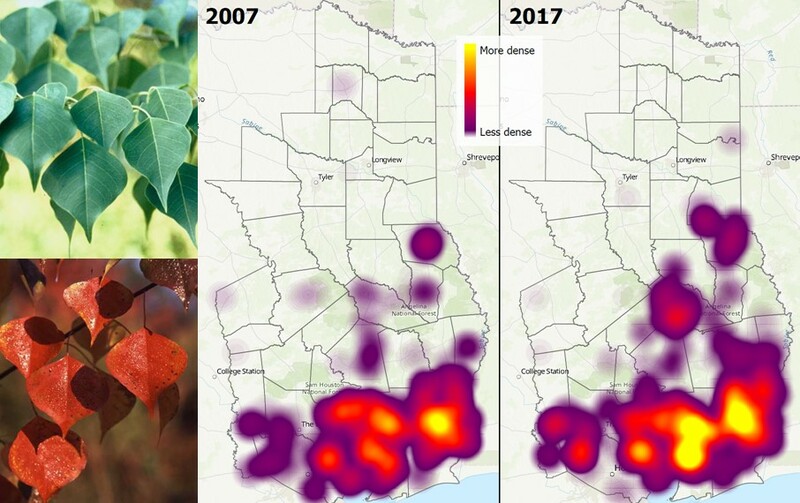 Tour this story map to learn more about Chinese tallow identification, ecology, ecological threat, distribution, invasion potential, and treatment options in Texas. Forests are critically important to protecting water resources and providing clean and abundant drinking water to millions of Texans. 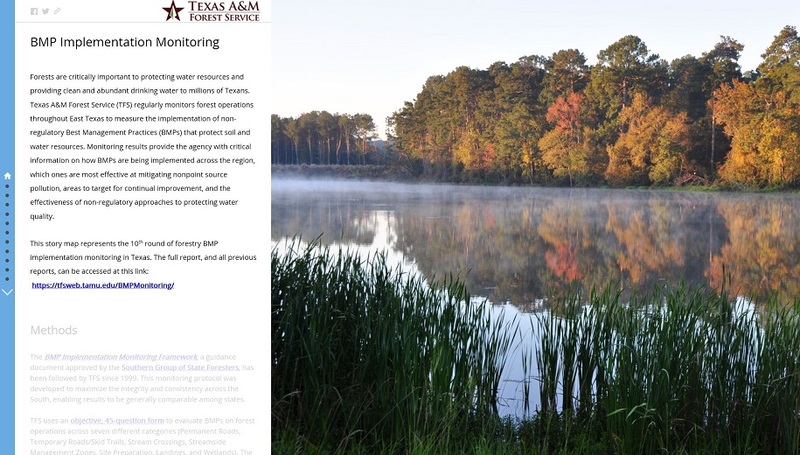 Texas A&M Forest Service (TFS) regularly monitors forest operations throughout East Texas to measure the implementation of non-regulatory Best Management Practices (BMPs) that protect soil and water resources. 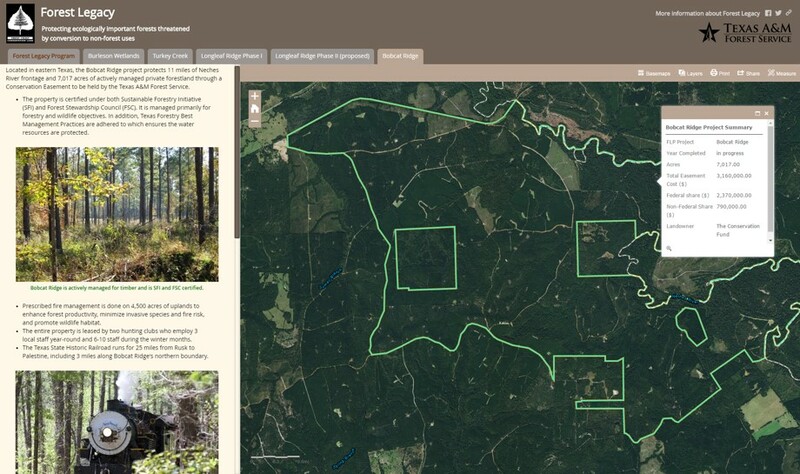 This story map represents the 10th round of forestry BMP implementation monitoring in Texas.